Original Thinkers–that’s whom you want to read. Here in Part 2 of Tocqueville Asset Management’s Rob Mullin’s article, he outlines why small-cap oil stocks could play catch up very quickly now. Despite extreme pessimism regarding the production cuts of a year ago, both OPEC and non-OPEC have achieved better than 100% compliance every month since. We also believe compliance will be less important, and indeed unnecessary, as global oil balances continue to tighten in 2018. The fear of restricted volumes returning to the market should be scaled to account for the “gaming” of the system as all parties maximized production before cuts were implemented, thus the 1.4 million barrels per day “reduction” was really only 600k-700k bpd from sustainable production levels. That represents the supply that can easily and sustainably be returned to the market, and equals roughly 6 months of global demand growth. And while the growth of US shale production over the last year has been significant -though below most expectations- incremental productivity seems to be flattening out. 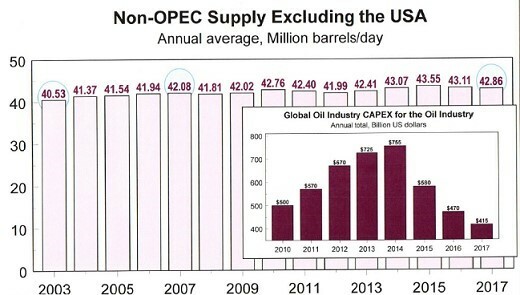 The rest of the world (which represents the remaining 40%+ of current global crude production) has been unable to grow supply even with $100+ oil from 2010 to 2014, and the 40% decline in global capex since then would imply that even steady production from the “rest of world” may be difficult to maintain. It appears to us that the large projects brought online which were greenlighted in that 2010-2014 period have mostly run their course, and the dearth of projects approved since then will leave a large hole to fill in global decline rates from 2020 on. While EV’s now represent approximately 1% of the global fleet, and have only achieved that with significant subsidies that have still left economics mostly unfavorable to traditional internal combustion engines. The financial burden of maintaining those subsidies as well as the infrastructure buildout necessary to support fleet expansion makes extrapolating that growth rate difficult. In terms of consumer preference, trucks and SUV’s continue to expand market share despite oil doubling in price over the last 2 years. It should be noted that, despite the attention and enthusiasm for EV’s, Ford still sells more F-150’s in a month than Elon Musk sells vehicles in a year. 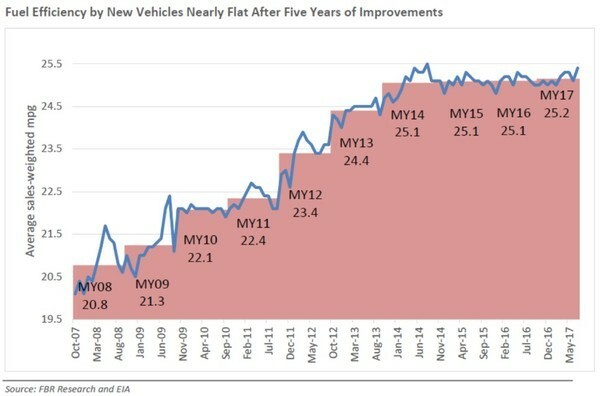 his is supported by the total US fleet efficiency statistics chart above, courtesy of Ben Salisbury at FBR, which exhibits a notable flattening over the last 5 years. Large Caps Show Signs of Life, Laggards to Play Catch Up? There was a severe divergence between natural resource index/etf/mega-cap stocks and the rest of the resource stocks in mid-2017, and that trend not only persisted but accelerated through the end of the year. The S&P Global Natural Resource (GNR) index did its best to keep pace with the broader S&P500–powered by the BHP and Glencores of the world, while smaller companies across the resource spectrum struggled to recover their 1H losses. This impacted the majority of actively managed natural resource funds, whose returns severely lagged the benchmark. The chart at right is illustrative, showing the GNR moving in relative tandem with the Russell 1000 Energy Index (largest energy companies) and the Russell 2000 Energy Index (small to midcap energy names) in two prior cycles. Historically all three have bottomed at the same time, with the smaller names subsequently outperforming during the upcycle by 1.4x to as much as 4x. 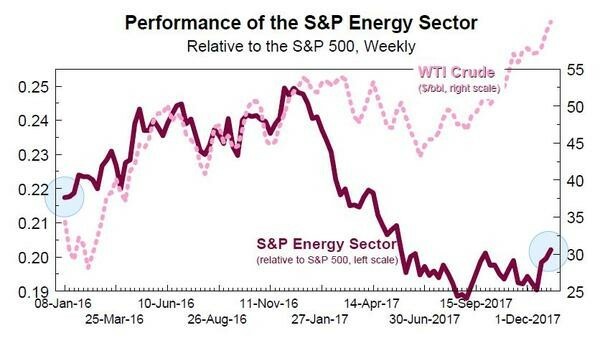 The story since 2016 has been very different, with the mega-caps leading the way, energy lagging and smaller energy names badly underperforming over the last 12 months. It is worth noting that other resource sub-segments (diversified metals & mining, etc.) have exhibited similar market capitalization skew over the last year but lack the historical data over prior cycles to include above. We are also aware that this isn’t a unique occurrence, as the broader market has exhibited many of the same performance skews in what has been a FAANG dominated period. 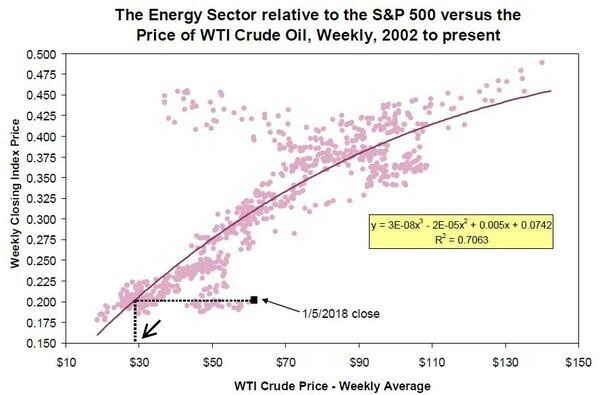 Below left you can see the divergence between energy equities (relative to the S&P500) and the oil price which is , according to industry veteran Mike Rothman from Cornerstone Analytics, the largest such spread he has seen in his 30+ year career. He also notes that both prior times the gaps reached similar levels that they were resolved by stocks rallying to catch up with oil. The chart at right below illustrates the last 16 years, showing exactly how extended this relationship has become. 1) Commodities are at their lowest levels versus equities in almost 50 years. 2) Commodity stocks in general have underperformed the commodities themselves, leaving them at their cheapest valuations relative to the broader equity markets in over 100 years. 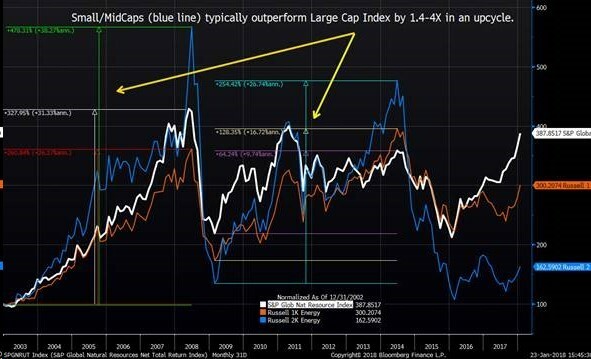 3) Small and midcap resource equities have significantly (and unusually) lagged their larger brethren despite consistent historical upcycle outperformance. Most market forecasters see a continuation of 2017 conditions, with modest earnings growth, low inflation, low volatility, expanding multiples and little, if any, impact from reduced QE or rising rates. The case for coordinated global growth nudging inflation expectations higher may well be gaining some traction. Over the last few months broader commodity indices as well as commodity currencies have been acting quite well. The largest commodity stocks have continued their upward bias, and thus far in 2018 the catch-up in small/midcap resource equities appears to be gaining momentum. These include a regression in global trade relations (EU/NAFTA), Super Power tensions between the US, China and Russia as well as a multitude of regional conflicts, many of which have the potential to impact global commodity markets. 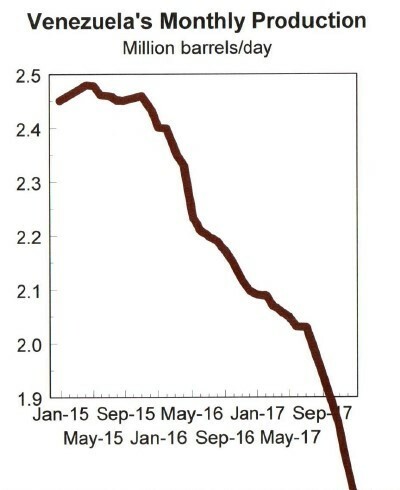 Where most analysts see the risk to oil on the downside as a result of returning OPEC barrels and US shale production, we see the implosion of Venezuela (see below), unrest in Libya, Iraq and Nigeria as well as political intrigue (and Yemeni missiles!) in Saudi Arabia as more significant risks to the upside. Similar catalysts could be identified in other commodity segments we favor, such as cobalt, platinum and palladium, and even diamonds. These concerns are in addition to the elephant in the room, which is exactly how does the slowing down or reversing of $10-$15 Trillion of coordinated global central bank accommodation impact the debt, equity and currency markets? As we are no more certain of the outcome than anyone else, we continue to believe that a significant allocation to natural resource equities offers investors considerable upside to a “catch up” with the rally in the underlying commodities. At the same time the group’s depressed multiples should provide substantial downside protection in a rather universally expensive asset price environment should markets reverse course. In particular we favor reasonably valued, high free cash flow/income generating resource equities, which in addition to carrying the aforementioned characteristics also represent a unique “rising coupon” in a world of loftily valued income alternatives.